Don't rush away from something just because it's uncomfortable. Grow in it and through it. Do not wait for anything too eagerly, everything will come to you on its suitable time. Sometimes it may hurt to wait, but it's never late to win. Stick to the fundamentals. That's how IBM and Hilton were built. Good things, sometimes, take time. If something is not happening to you, doesn't mean it's never going to happen. Sometimes you're just not ready for it. Patience is the companion of wisdom. It is very difficult to be patient and when practiced and mastered, bears great fruits. There is no greater penance than patience. The results of it will be sweeter though it takes a little long time to ripe. “Patience and perseverance have a magical effect before which difficulties disappear and obstacles vanish” said john Quincy Adams. 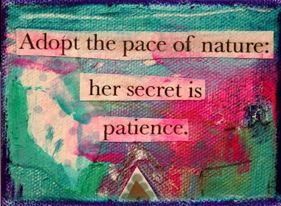 Patience should not be mistaken for idleness or inaction. It is also a form of action where in we silently observe and postpone the time in which we can act. Sometimes, when we lose a little patience, we are forced to face very bad consequences and that is the time we realize the fruitfulness of patience. The trees that are slow to grow bear the best fruit as Ralph Waldo Emerson said “patience and fortitude conquer all things”. Learn from the caterpillar which patiently waits in the cocoon to become a beautiful butterfly.